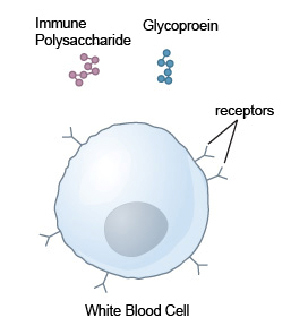 "...polysaccharides increase the ability of white blood cells (macrophages) to destroy infectious organisms..."
Glycoproteins and immune polysaccharides increase the ability of white blood cells (macrophages) to destroy infectious organisms and may possess bone marrow stimulating activity. They may also help promote the destruction of solid tumors such as fibrosarcomas and have proven very useful in the treatment of immune deficiency disorders of cats such as feline leukemia virus (FeLV) infection and feline immunodeficiency (FIV) infection. The most commonly prescribed biological response modifiers are acemannan and mannose. 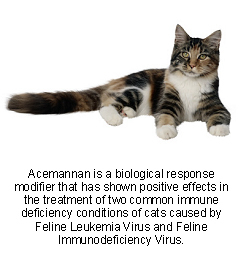 Acemannan also helps stimulate the immune system to fight certain infections more vigorously, including candidiasis (a yeast infection), Feline Leukemia and Feline Immunodeficiency Virus. "...macrophages, are the first cells to confront and attack a foreign invader in the body." Part of the improved response in fighting these infections comes from acemannan's specific stimulation of macrophages, which are the first cells to confront and attack a foreign invader in the body. In one study of cats with advanced FIV, acemannan treatment resulted in a reversal of the usual swings in white blood cell counts. The overall survival rate was 75%, with some of those cats surviving over one year at the end of the study. 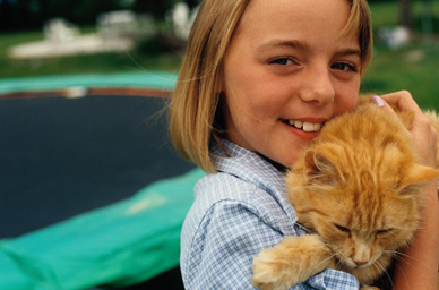 Similar positive changes were seen in a much shorter-term study of the effects of acemannan on FeLV. Much of the research has been done with acemannan in injectable form, but the FIV study demonstrated no significant difference in response between weekly injections and daily oral administration methods.